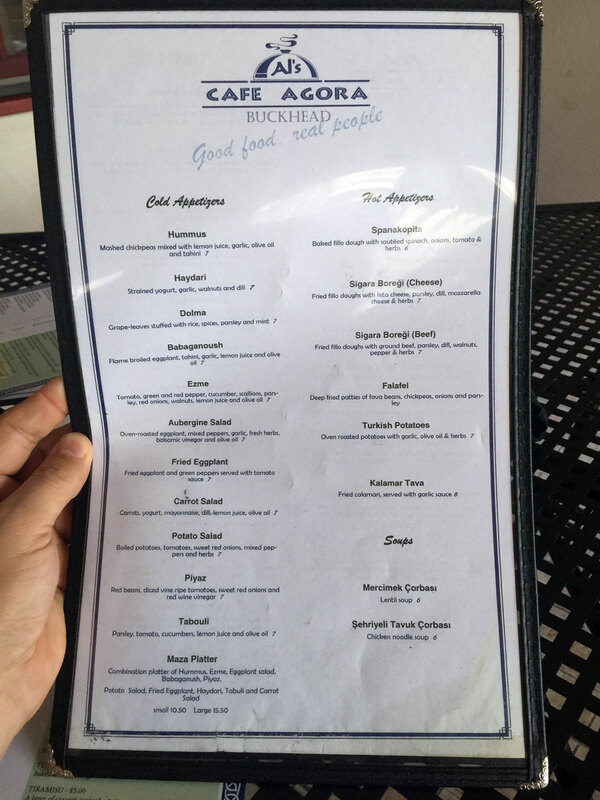 This location of Cafe Agora is located 318 E Paces Ferry Road, Atlanta, GA 30305 to the left of the Buckhead location of Meehan's Public House and across the street from a bunch of Buckhead galleries. I had the opportunity to visit Cafe Agora at its new location on E Paces Ferry Road last week after a technology MeetUp held at Fado. 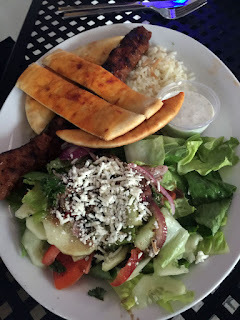 While Fado has decent Irish cuisine and bar food, having recently eaten there we decided to walk over a couple of blocks to Cafe Agora. 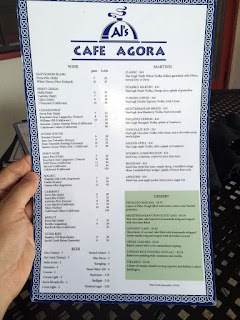 Cafe Agora is a Turkish style Mediterranean restaurant - the influences are Greek, Arabic and Persian, so it's a bit of a mixed-bag (not in a bad way) of complimentary cuisines. The restaurant was just starting to get busy (this was a Monday night) - the patio was mostly full and the interior about half. 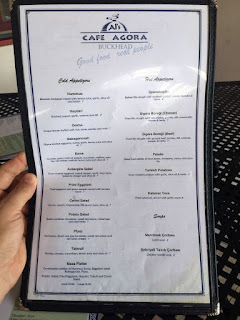 I think this is a good location for a casual business meeting or to kick back with a glass of wine to observe the antics of Buckhead locals or obnoxious visitors (like me!). 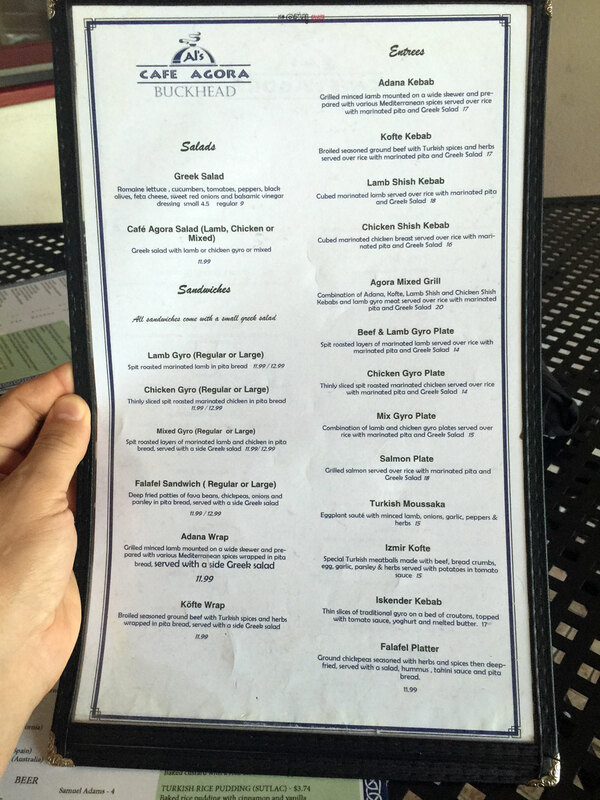 The restaurant is fairly new at this location and still well kept and clean. We sat on the patio and were immediately greeted. 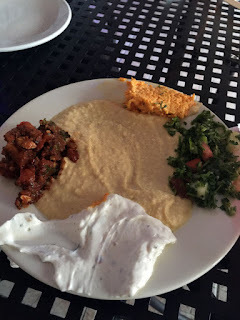 The menu is fairly extensive with many of the usual options like hummus, dolma, babaganoush, tabouli and the like, along with your typical gyro-like meat concoctions. There are also some interesting bits you don't typically see, like the haydari, plyaz and soups like Mercimek (lentils) or Sehriyeli Tavuk (chicken noodle) Corbasi. 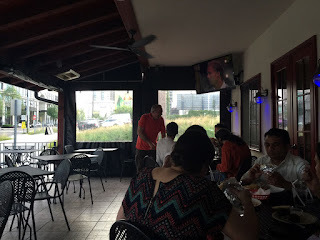 While viewing the menu the owner came by and offered up a sampler of apps to try - I believe it was parts of a small Maza platter (it helps to come here with a regular who was immediately recognized). Besides some hummus and tabouli, the other very strongly flavored spreads were quite very good. 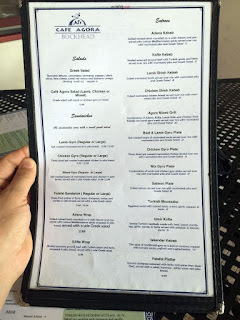 The flavors were subtlety different from our average Mediterranean and I found that to be so in the entree as well. 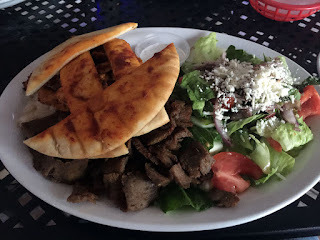 I ordered the Mix Gyro plate with included both chicken and beef/lamb Gyros, over rice with a Greek salad - the marinated pita had a bit of red tint to it (tomato I think or maybe roasted red pepper?) that wasn't immediately identifiable but added just a hint of acid that did a good job cutting through the delicious meats. Both my dining companions ordered the Adana Kebab - grilled minced lamb on skewer with marinated pita and Greek salad. Give Cafe Agora a try - I think you'll like you find here.